To Canada's Copyright Board, Bar and Other Stakeholders: "When you come to fork in the road, take it!" 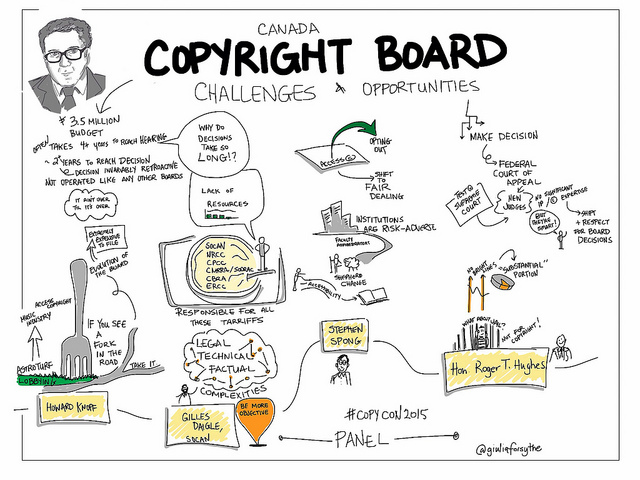 The #CopyCon2015 conference on October 2, 2015 at U of T was very interesting - particularly the contributions of former SCC Justice Ian Binnie who warned about double dipping and pushing too hard to appropriate parts of the commons, and Prof. Ariel Katz who provided an extended metaphor about copyright and coming of age and why stakeholders need not any longer act like or be treated as children. This will all be archived, I am told, for those not fortunate enough to have been there. Update - the webcast archive is here. My presentation is at the 5 hour 25 minute mark. Here's my modest contribution about the Copyright Board, which kicked off a panel that I helped to organize that included Justice Roger Hughes, Gilles Daigle, Stephen Spong and which was moderated by Ann Ludbrook. Thanks to all....including Bobby Glushko, Graeme Slaght and Canada's premiere one and only brilliant copyright "Official Doodler", @GiuliaForsythe. Hopefully, U of T will do this again next year.The library and academic communities really need empowerment, which can only come from full and frankly provided information.